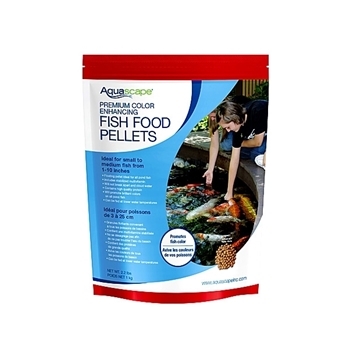 Aquascape Premium Color Enhancing Fish Food Pellets have been scientifically formulated to provide premium nutrition to all pond fish including goldfish and koi. The inclusion of Spirulina, Krill meat, and Axtaxanthin helps promote brilliant fish color. The medium pellet size is ideal for fish from 1-10 inches in length. The large pellet size is great for fish 8 inches and longer.